A good Monday to you! We had a pretty uneventful weekend which is so nice sometimes. The weather finally was gorgeous and we took full advantage. Saturday was our nephew’s birthday party and it was hosted at a local park. 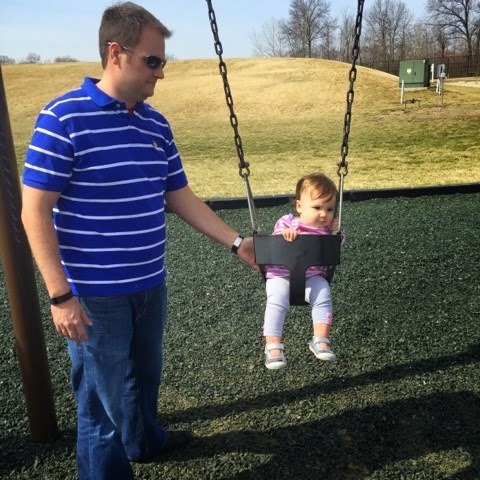 We had lots of fun visiting with our family and swinging. The playground was geared towards bigger kids, so Miss H was limited on her play options. She still insists on walking up slides. Sunday we stayed in, hubs grilled up some Coca-Cola Ribs (so good) as I prepare to go Sugar Free and Gluten free for the next 21 days. One of the biggest things with PCOS is diet and eliminating those can really help in a positive way. I have one heck of a sweet tooth, especially after going back on all my PCOS meds 3 weeks ago – all I want to eat is sweets! 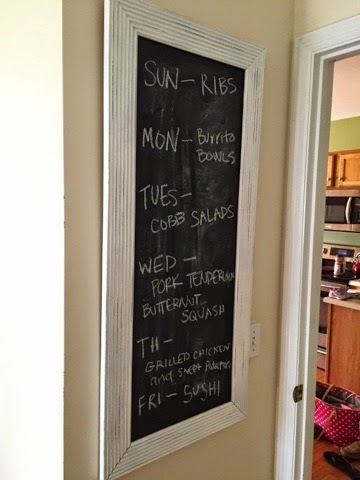 I made our meal plan for the week, and we don’t have anything that will throw us off base unless hubs has to go out of town for a quick trip which is possible. I’m also excited because this weekend I finally found a pair of jeans that I found semi suitable. I bought 2 pairs of Old Navy Pixie Jeans right after H was born and I’ve lived in them ever since. Depends on my top, they look like Mom Jeans. Insert gagging noises here. So I opted for a ripped up pair of Boyfriend Jeans. They are pretty cute – Jeff thinks it’s silly to pay for holes in your jeans. I paired them with a Boden tee for the party and flip flops and I’m sure people questioned where my dress was as I wear them 90% of the time! I forget how much I love Head and Shoulder Shampoo – I had a bottle from crazy prego hormones and it makes my hair look so good. I know – who would have thought – H&S Sleek! I also did a little Jen shopping this weekend. 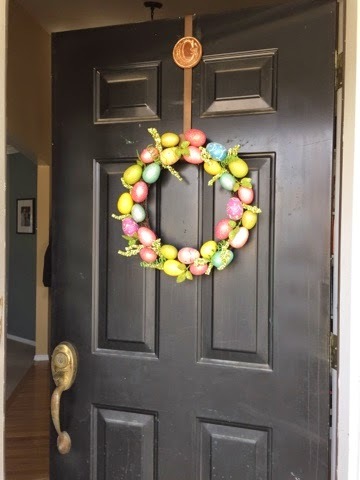 I ran to Kirklands in hopes of finding a new wreath as I’m dying to update or front door. It’s getting a new coat of paint and hardware here in the next few weeks. 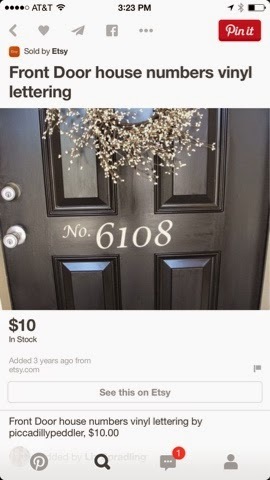 I’m wanting to put vinyl letters on the door. Jeff said no. What say you? 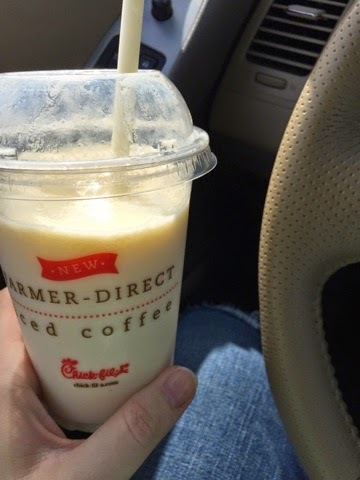 I also treated myself to the new Frosted Lemonade at Chick Fila – So good! Oh my stars, your little is too presh! And I say go for the vinyl letters–I've been dying to put them up myself. I went to Chick-Fil-A on Friday and it wasn't until I pulled out of the parking lot that I saw the frosted lemonade sign—I mean, for reals, Chick-Fil-A employees, tell a sister about that in the drive through. Yes, I know #firstworldproblems. LOL! Definitely do the vinyl, don't you have a Cricut? You could totally do them yourself! And they would be super easy to remove if you didn't like it. I desperately need new jeans but really want to get more on shape before paying for them, so it's like lose-lose right now haha! And I love head and shoulders shampoo every once in a while too!